Mens walking suits have become the favorite choice of well dressed men who favor dressing in a manner that is meant to garner attention in a sophisticated effort. When it comes to mens walking suits, style and patterns always matter and unique features are always a way to make the walking suit stand out big time. 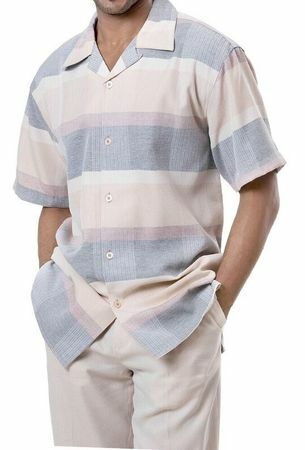 This pastel beige walking suit is made by Montique Clothing and features a really rich classy looking color that is basically a combination of pastel colors together making for a very unique looking color for the warmer months. The pants are pleated. Fabric is made of soft poly.